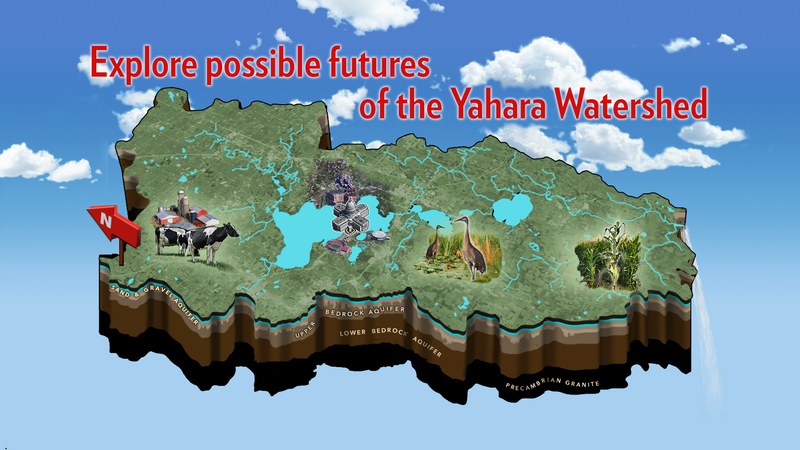 Click the icons below to explore what ecosystem benefits could be like for future generations, based on the changes that occur in the Yahara 2070 scenarios. Food Production: How many people could the watershed feed? Lake Water Quality: How clean could the Yahara lakes be? River Water Quality: How much phosphorus pollution could be in the Yahara River? Climate Regulation: How much carbon could the watershed store? Flood Regulation: What is the worst flood that could happen? Biofuel Production: How much biofuel could the watershed produce? Groundwater Quantity: How well could drinking water be replenished? Groundwater Quality: How much nitrate pollution could be in the drinking water supply?